← Hell Hath No Fury As A Woman With A Hammer, Screwdriver and Crowbar Does! You know that was the famous line in the movie Forrest Gump. Well today cleaning and clearing out my closet you never know what you are going to find! We have been working on the bedroom area this week. My previous post was cleaning out the bedroom, tearing all the trim and baseboards out along with taking out the door frames, getting ready for the painters tommorow.. Well they better be here. I am about to call Roger. 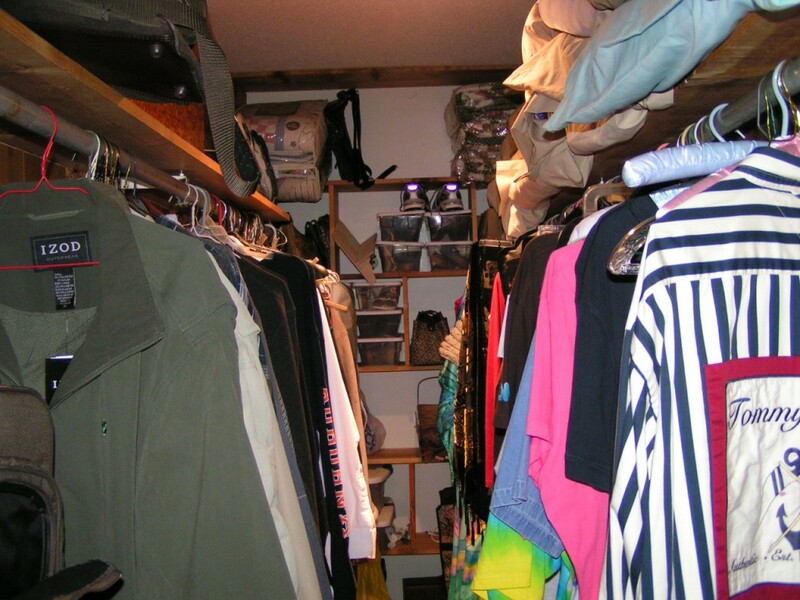 Gary and I have a nice size walk in closet we share in the bedroom. I have my stuff on my side and what will not go on my side I put on his. Yes I said it. 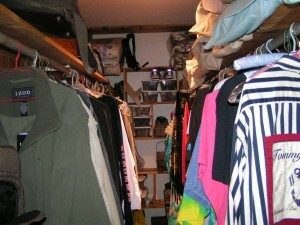 I hog the closet. Well at least I am honest. Today was a very trying day. “Why did you have this? Where did you get this? Why are you keeping this? ” you know the routine. I started to shut the closet door and lock myself in except.. I do not have a door on the closet. It is on the sunporch waiting to be taken off. The closet was a mess. So what would any self respecting woman do? Clean it up.. I hauled EVERYTHING that was in there out in the bedroom that is going to be painted tomorrow so there is no way I could start and not finish. I did this on purpose so my “I will wait until tomorrow to finish” did not take over. 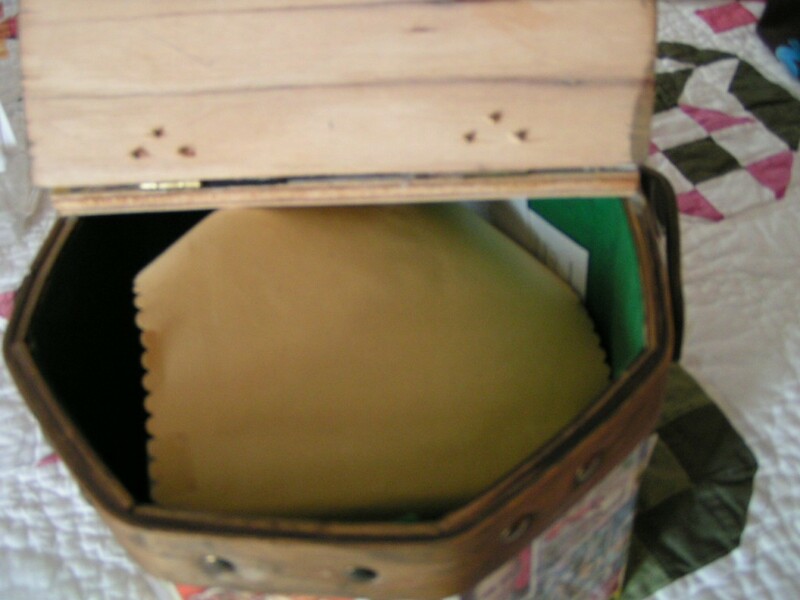 I went through storage tubs of clothes and sending The Mission 3 large leaf and lawn bags. Here are some pictures and one of a very special treasure. I will post the picture and a description under it. Yes I have a naked man and woman on the lid of my purse. 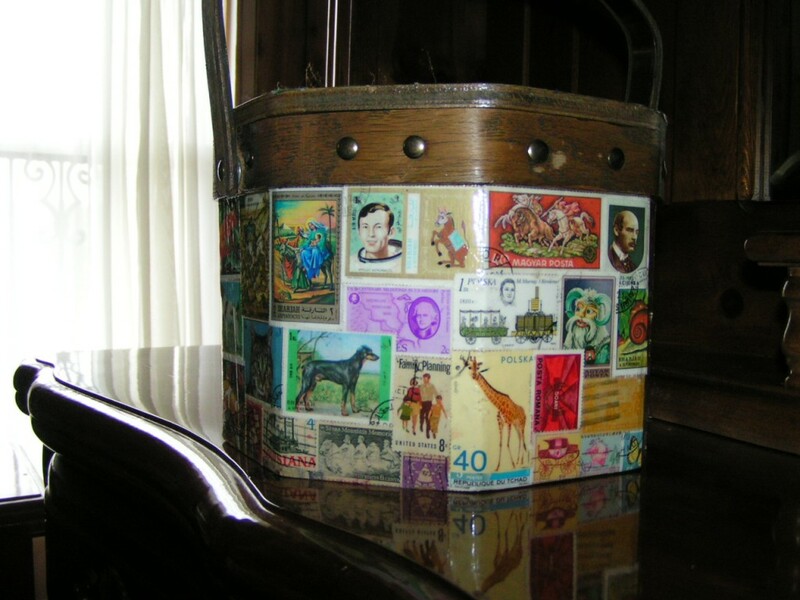 Back in the 70’s probably 1976 I bought this wooden purse that I put together and then I added all these great stamps I had collected and then sealed the purse. Inside I had covered it with green felt. Yes I said felt or it could be velvet! I found the purse today stored away and I was so happy. I like unusual things and I am going to enjoy carrying this. It is a conversation piece. IT ALSO HELD A TREASURE I HAD FORGOTTEN ABOUT. That will be later. Two better pictures of the wooden purse. I raised the lid and saw something inside. What can this be? Then I pulled out a receipt for eight dollars and some change. WHAT??? 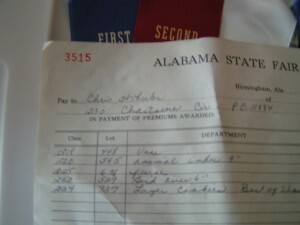 It did have my name on it and dated 1987. 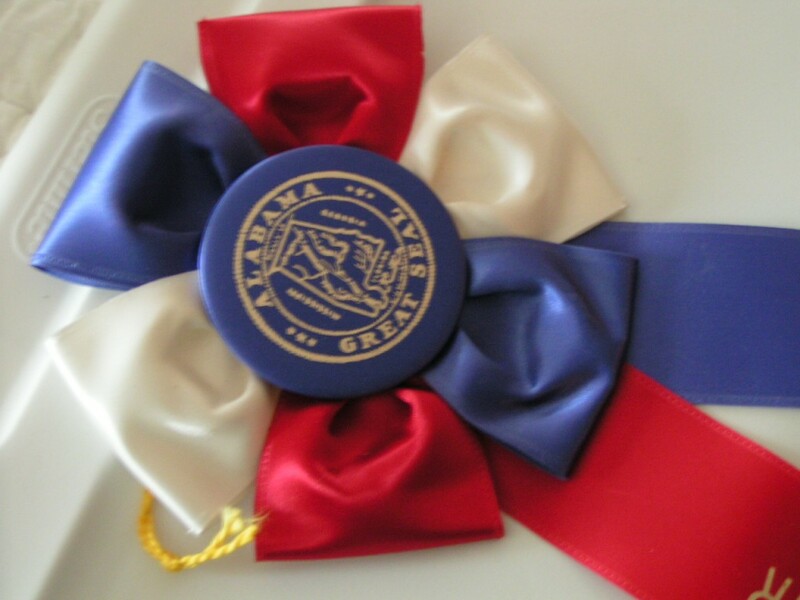 A ribbon? With the Seal of Alabama on the ribbon. WOW! First, Second and Third! Oh my! WHAT???? It has my name on it… BEST OF SHOW IN THE COOKING DEPARTMENT! I KNOW SOME OF YOU FAINTED. You all know about my fussing, cussing, gagging articles about my terrible cooking. 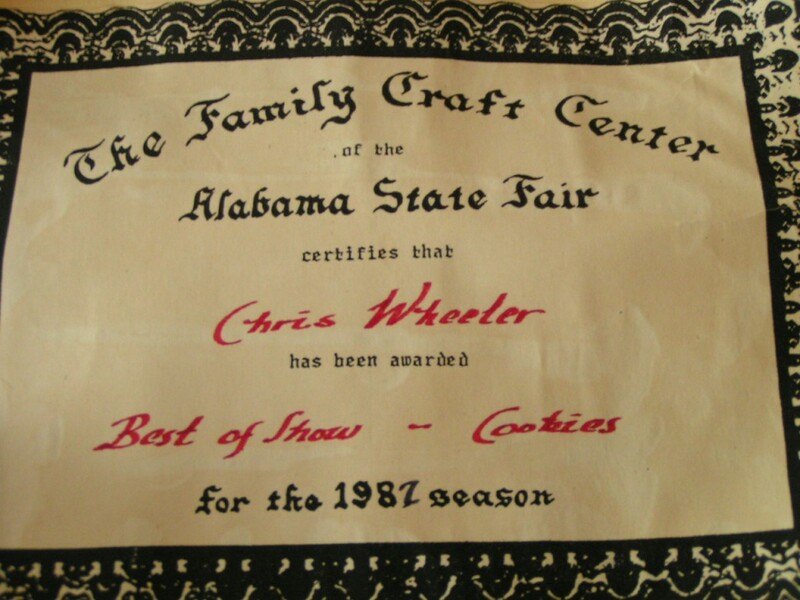 I had totally forgotten about this that in October 1987 at the Alabama State Fair held at the Fairgrounds at 5 Points West, Mrs. Chris Wheeler WON yes I said WON Best of Show.. Do you think I was the only one that entered that year? Seriously I totally had forgotten about this. I was a newlywed and now that I think about it my husband was beaming that night we walked up hand and hand and looked in the glass cabinet with my certificate, my name, his last name and my plate of cookies that I had baked on display with my BIG OLD BEST OF SHOW.. Poor thing, did he not know the tables were going to be turned that some alien was going to take over my body and I lose all my cooking abilities!! The other ribbons were for some pottery pieces I had entered. I took home about 7 awards in that department! I promise I am going to try to do better! I decided I was going to have my certificate, my ribbon and my receipt for my $8.25 cents monetary award I received framed and hung proudly in my kitchen! What do you all think? 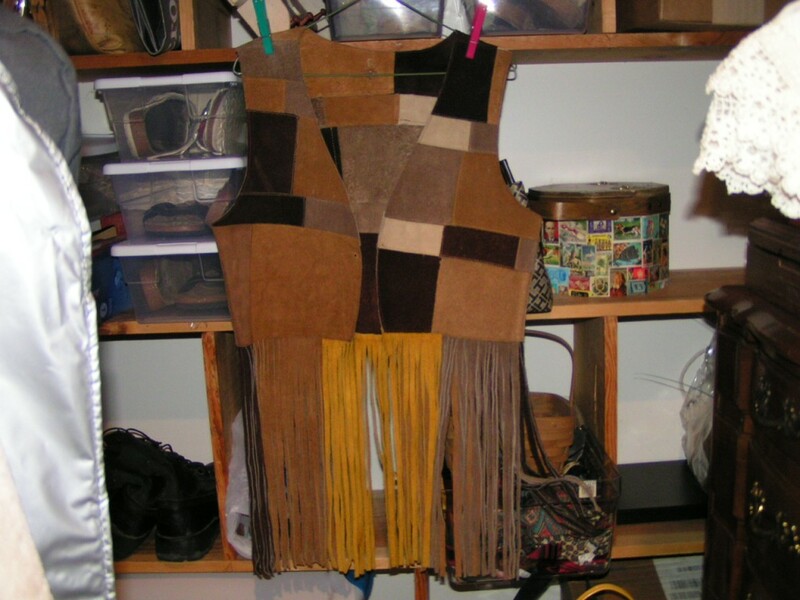 I also found another treasure.. My hippie vest that I have had for 45 years. I did not find my belt with the bullets that we wore nor my big peace medallion. I truly would have had a perfect day if I had found that. I can get the vest on. It came half way in front. IT NEVER will meet. Think of how you looked at 13 and how you look now.. from freckles to…. Never mind you get the picture. I am going to be working on my Hippie room very soon. When I do that this will hang up on the wall with my mosaic guitar along with my Woodstock poster. Closet straight. All my stuff on my side. Well why am I lying.. there is about 25 purses on his side in the back hanging on a shoe rack. But I figure that is in the back and anything goes. I threw out, culled out, straightened out, hung up better, took all my shoes and put in plastic containers so I could see how many pair I need for this year. 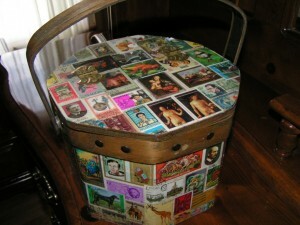 Took my boots and put them in plastic containers and there was just ONE THING I COULD NOT” BARE” TO THROW OUT! I will try to find my cookie recipe and post it. Just call me Aunt Bee, Betty Crocker, Martha Stewart, Rachel Ray or anybody but PAULA DEEN!! You’ll have a fight on your hands then! This entry was posted in 2012, House Pictures, Main. Bookmark the permalink. 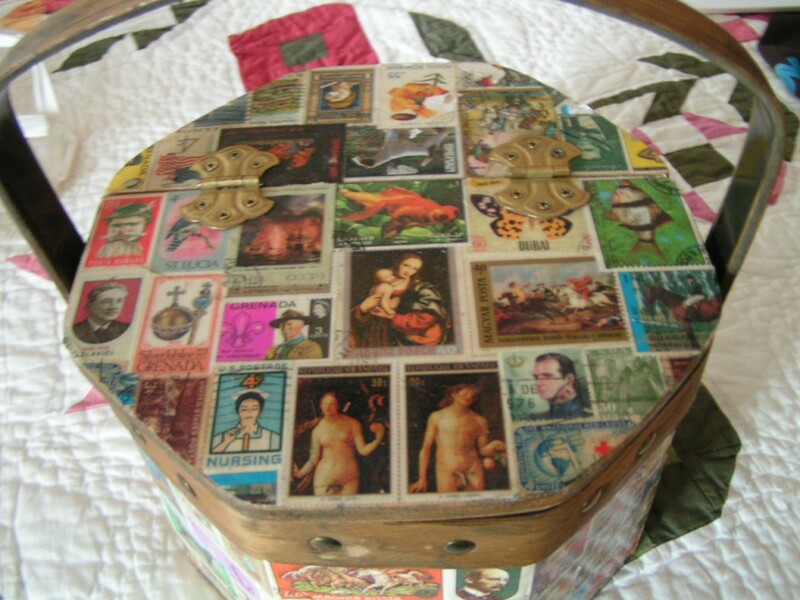 5 Responses to Life Is Like A Box Of Chocolates, You Never Know What You Are Going To Get! 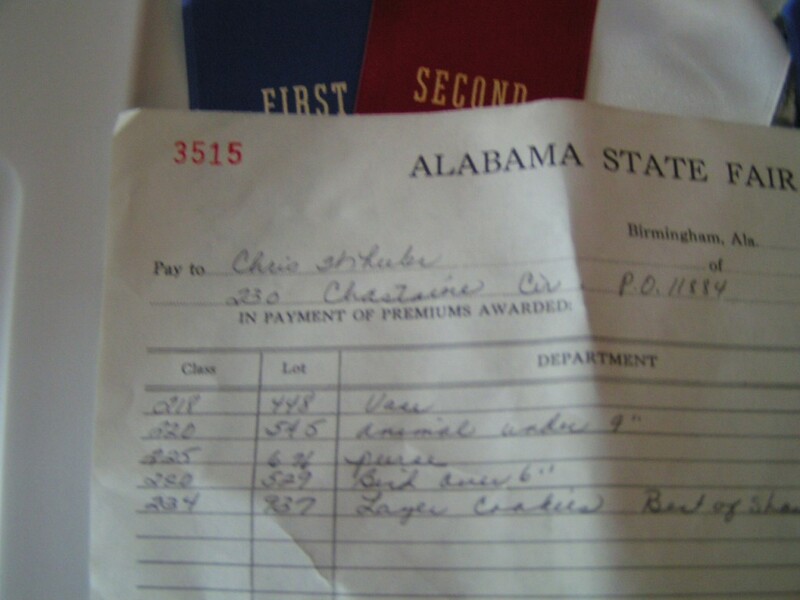 Oh, Chris, you are a hoot! I love your humor – and am sure that someday, somehow, we are going to meet in person! Count on it! WOW!!! You had quite a day my friend!!! Lots of memories and lotsa laughs (I hope!!). Love to read about your adventures……….. I am going to give that award winning recipe a try. 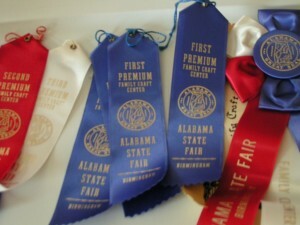 Too bad you didn’t have a pic of it in the display case with the ribbon & certificate! I had a dark brown vest that looked a lot like yours. That long, long fringe on it was great. 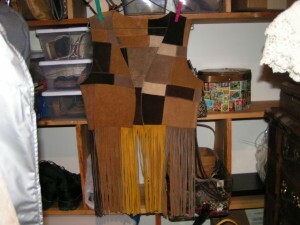 I wore it with my hip hugger pants & wide leather belt. It was passed on to my sisters & who know where after that. That Abercrombie bag should be framed & put on the hippie room’s wall! Wow! I had a purse that had been decoupaged. Never tried to do one myself. And a little square wooden purse that had been covered in leather that I really loved. Wish I still had some of that stuff. 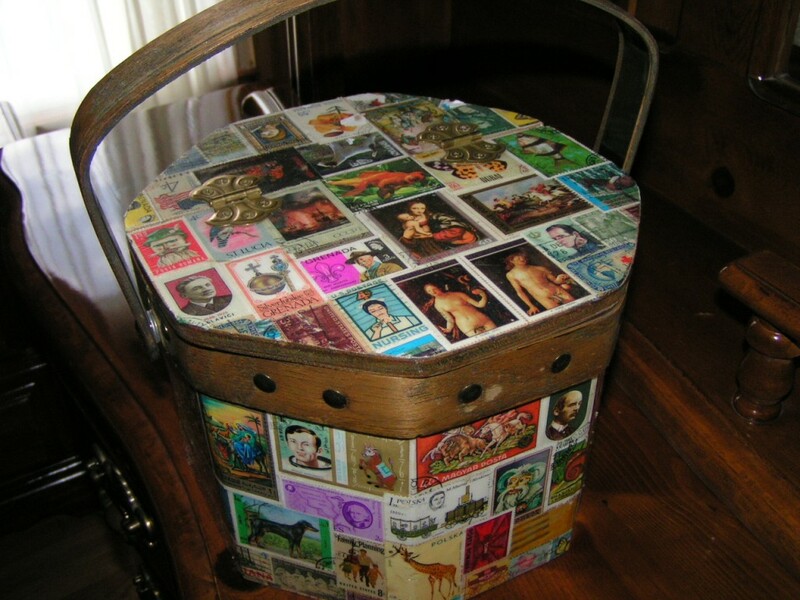 I love collecting stamps so I would love to see that purse with all the stamps on it. What an interesting day & great finds while cleaning out your closet. Don’t you mean “your closet is like a box of chocolates…”!!! I had fun going down memory lane with you. I also have a picture of an almost naked man that I will never get rid of, but he’s a guardian angel. 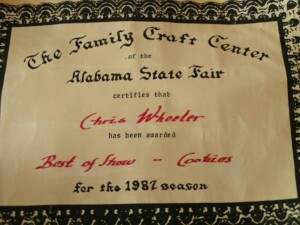 Congrats on Best of Show for your cookies. 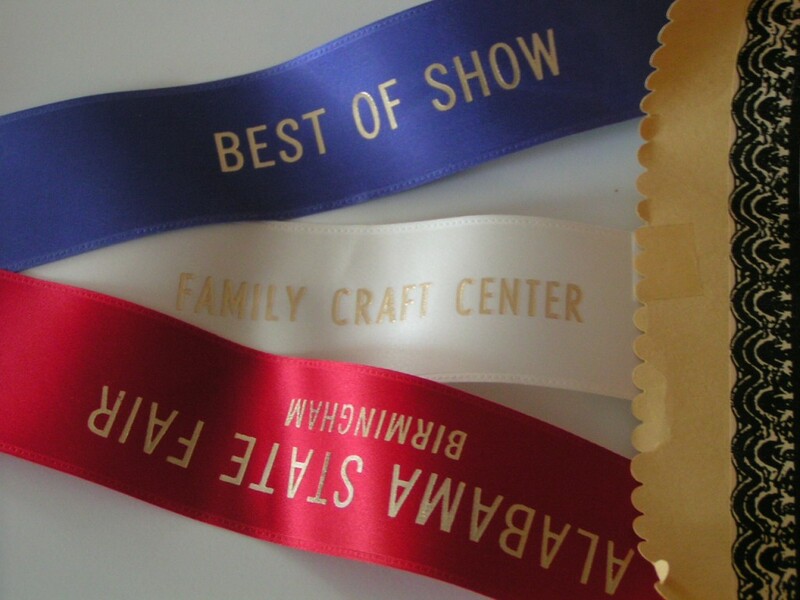 I’ve won several ribbons at the Texas State Fair for crafts and I think they pay the same prize amounts now as they did back in the 70’s!